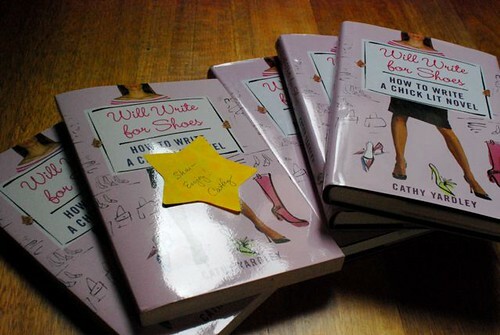 To celebrate my return to a "proper" writing life and the resurrection of eWriteLife, I'm giving away ONE (1) hard bound copy of "Will Write for Shoes: How to Write a Chick Lit Novel " by Cathy Yardley. Cathy herself actually donated some copies of her book for my different blogs/sites and projects. And, I decided to use one of these books right here, right now. 1. Leave a comment in this post answering the question, "Why do you like to write?". 2. Blog about eWriteLife and/or this contest in your own blogs. 3. Tweet/Post to Facebook (or other social network) this contest and/or eWriteLife. Each comment will be considered to be one entry for the giveaway. A blog entry will be another entry. And, a social network post will be another entry. Each individual may have 1 entry for each (a total of 3). Contest ends on 2nd of November 2009 (Adelaide, Australia Time). Winners will be drawn randomly and announced on this blog shortly after. The winner should be prepared to provide complete mailing address. Last year, I made it a point to join NaNoWriMo for the first time. And, although I didn't end up finishing my novel, I'm happy to say that I continued to work on one of those that I started. Yes, I started about three during that month! Eeeps. Anyway, I still love those stories that I started and I hope that I'll get to write and finish them one day. But yeah, I think part of the problem was that I entered NaNoWriMo last year without planning. I didn't have a story. I didn't have any idea about what I was going to do. So, I got lost in the process. This year, I wanted to try to join again. However, as I was plotting and planning, I ended up starting to write my current novel about two weeks ago. So, I think that pretty much ruled out NaNo this year. Probably just as well, as I'd be going away for a holiday overseas by the end of November anyway. At least, I can now say that YES, I AM WRITING! Really writing. It has been a while since I last worked on a novel every single day from start of the idea. So, I'm really glad that I finally found a story that I'm busting to write. So much so that I'm actually dreaming inside my novel some nights. Heh. Anyway, I've been so excited about working on this project so much that I decided to revamp eWriteLife once again to reflect a new phase of my writing life. For one thing, I wanted to have a place where I can share my writing goals and progress. Although I do have a personal blog, it doesn't seem right to turn it in to a full writing blog (especially since I have eWriteLife!). And instead of starting yet another blog, I thought I might as well use this site. So, yes, even though I do feel a bit scared about the whole idea of sharing my ongoing writing work, I thought it might be a good way for me to stay motivated and accountable. So, other than making this formal announcement in this blog post, I also added a "Scribometer" on this blog's sidebar. There, I hope to share my fiction writing progress. Plus, I'm also hoping I can write about where I am in the process of creating this novel on a regular basis. We'll see how it goes! I guess, that's one of the strengths of doing NaNoWriMo. When you have an actual goal, and you make this goal public, and you know you have other people working with you on the same thing, you become more motivated. And I suppose, even though I'm not able to join NaNo this year, I'm still hoping to have a similar motivation through eWriteLife. Oh, and since I've been doing a lot of research and I'm keeping a closer watch on the writing and publishing industry again, I started to collect more and more interesting resources again. So, I plan to share those things on a more regular basis with you too. Even just in short posts. I'll start to share snippets of writing prompts again too, whenever possible. Just like I used to. So, what about you? Are you taking part in NaNoWriMo this year? Are you already working on your book?